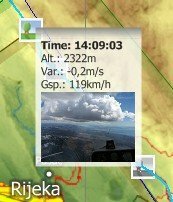 Hover your mouse over a waypoint and it will display the details about that waypoint. Plus it will download a satellite picture of the waypoint so you can see which exactly what ground feature is at the location of the waypoint. Other minor improvements and a few bug fixes were done in version 6.2. You can see the full list in the SeeYou Change Log. If you don’t have a current SeeYou subscription yet please use the coupon code “SEEYOU2015” for your order until December 31st to enjoy a 20% discount on your SeeYou license in 2015. The coupon is valid for new purchases and upgrades.